Started in 2012, contemporary jewellery brand Astrid & Miyu has built itself a cult status amongst influencers and celebrities alike. 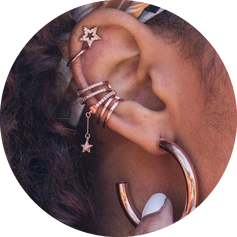 Specialising in “stackable” jewellery, the brand worn by the likes of model Chloe Lloyd, influencer Lydia Millen and reality tv host Alesha Dixon, invites shoppers to express their individuality and tastes through their eclectic ranges. Encouraging a distinct personal style has become a signature of the brand and it wanted to make sure that this was reflecting in the marketing messages - with a particular focus on creating personalised experiences for shoppers at different stages of the customer lifecycle. Astrid & Miyu’s marketing team recognised that taking a more personalised approach to their marketing would reap rewards. But they were prevented from putting this into action by their ESP, which didn't give them any sort of meaningful customer insight or the means to segment or tailor their emails to the individual recipient. There was very little personalisation and an inability to dig into the data to truly learn about its customer. Calling upon Ometria, the brand is now able to create more sophisticated campaigns - both newsletter and automated - that are individually personalised based on insights provided by the platform. Shoppers at different stages of the customer journey receive emails campaigns that are specific to their interactions with the jeweller. This means they are able to create truly personalised experiences for their shoppers, increasing customer lifetime value and fostering loyalty. This blog will explore three examples of eye-catching automated campaigns Astrid & Miyu have implemented.